In modern plumbing, a drain-waste-vent (or DWV) is part of a system that removes sewage and greywater from a building, and regulates air pressure in the waste-system pipes to aid free flow. Waste is produced at fixtures such as toilets, sinks, and showers, and exits the fixtures through a trap, a dipped section of pipe that always contains water. 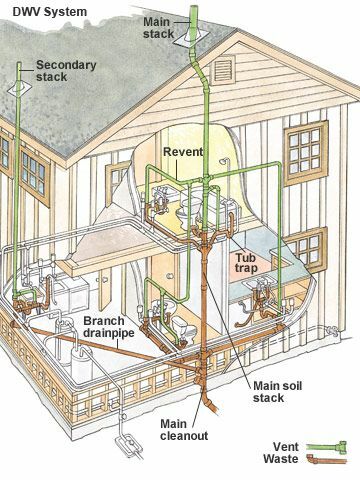 Every fixture is required to have an internal or external trap; double trapping is prohibited by plumbing codes due to its susceptibility to clogging. Every plumbing fixture must also have an attached vent. The top of stacks must be vented too, via a stack vent, which is sometimes called a stink pipe. The venting system, or plumbing vents, consists of a number of pipes leading from waste pipes to the outdoors, usually through the roof. Vents provide a means to release sewer gases outside instead of inside the house. Vents also admit oxygen to the waste system to allow aerobic sewage digestion, and to discourage noxious anaerobic decomposition. Vents provide a way to equalize the pressure on both sides of a trap, thereby allowing the trap to hold the water which is needed to maintain effectiveness of the trap, and avoiding “trap suckout” which otherwise might occur.